Chinese is one of the many languages spoken in Asia. It is becoming increasingly important worldwide as China rises as a global economic power. It is also the language that accounts most native speakers in the world, with over 1200 million people, and more and more students learning Chinese as a second or third language. China is an ancient country. The first settlers arrived to the Huang He (Yellow River) Basin around the year 3500 B.C., which makes China one of the cradles of civilization. At first, their life was based on agriculture, hunting, and animal husbandry. The first record of a ruler starts around 2200 B.C. with the Xia dynasty. It ended around 1700 B.C and little is known of this period, since there are no written materials. 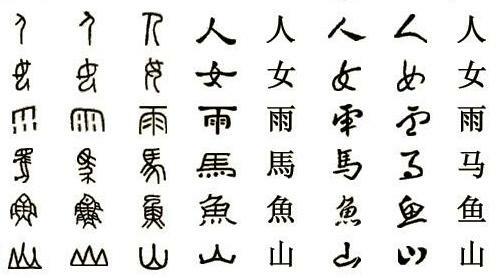 It was followed by the Shang dynasty, and around this time the first evidences of a true writing system appeared. They are rudimentary characters inscribed on animal bones and tortoise shells that were used as oracles to tell the future, hence the name, oracle bone writing. The bronze metallurgy that appeared in this period took Chinese civilization to a high level. The next figure shows the evolution of some characters from the oracle bones, to modern simplified writing. In 1027 B.C. the Zhou Dynasty started. It would become the longest dynasty in China, lasting until 221 B.C. As the Zhou were diminishing around 475 B.C., the Warring States Period begun. Those were difficult times filled with strife, but Chinese culture flowered and became a "golden age" of thought. Confucius funded his school marked by a rigid moralism which would have a great effect on the life of the Chinese. Taoism also developed in this period. It opposed to Confucianism since it proposed to follow the natural flow of the Tao (way). They both endure until today. The ruler of the most aggressive state, Qin (picture), finally took victory over the others and named himself Qín Shǐ Huángdì (First Emperor), starting the Qin dynasty in 221 B.C. He unified the states, money, writing and measure systems throughout China. He died ten years later in the year 210 B.C. but his imperial system would continue for the next two millennia, until 1949 when the People's Republic of China was funded. mutually unintelligible and some linguists consider them different languages rather than dialects. The most important ones are Mandarin that is spoken in Beijing and constitutes the official language. It is also referred to as "pǔtōnghuà" or simply "common language". Wu is spoken in Shanghai. Min is spoken in Taiwan, and Yue, more commonly known as Cantonese, in the province of Guangdong and Hong Kong. Other dialects are Jin, Xiang, Hakka, Gan, Hui and Ping. The first character set that was widely used was the traditional set. It emerged during the Han dynasty and remained more or less stable for two thousand years. Recently, the government introduced the simplified set, which is a simplification of the traditional one following a set of rules. The main reason for this was to increase people's literacy. This is the official set and most widely used nowadays. However, the traditional set is still used in Hong Kong, Taiwan, and Macau. 1. 甲骨文, jiǎgǔwén: first rudimentary characters on bones, used in the Bronze age until 1050 B.C. 2. 大篆, dàzhuàn: script used before the Qin dynasty. 3. 小篆, xiǎozhuàn: unified script imposed by the Qin dynasty. 4. 隶书, lìshū: dominant in the Han dynasty. With time, it evolved into standard script. 5. 楷书, kǎishū: appeared around the year 150. This is the traditional set. 6. 行书, xíngshū: semi-cursive script derived from the clerkly script. 7. 草书, cǎoshū: cursive script. Developed during the Han dynasty. Fast to write but hard to read. 8. 简化字, jiǎnhuàzì: modern day simplified characters imposed in the PRC in the 1950's.